I can't even wrap my mind around how gorgeous this book was. Dominique Christina is a poet and you can feel it in every word and phrase of this book. How beautifully refreshing to read a text praising the shapes and sounds and voices of women in all their pain and ferocity and joy and glory. My heart ached and sang and cried in my chest as I read this book, and my soul feels fuller having finished it. I wish there was more. I wish everyone who is or knows or loves women could read this. I wish there was more. For me this book vacillated between profound and profoundly annoying. I'm a spiritual person but I'm not a poetry slam loving earth mother type. I like to be introspective but I don't care for navel gazing. I appreciate what is intended with this book but I just got impatient with it (so many archetypes! so many writing activities! ) midway through, and ended up skimming through the rest so I could take it back to the library in time. I'll keep it in mind. I could see maybe picking it up again in the future. This is Woman’s Work. Dominique Christina. Due for publication October 1st 2015; Sounds True, USA. Uncorrected proof obtained from NetGalley. It is quite obvious from the beginning to the end of this book that Dominique Christina is of African American descent, as she refers to it over and over again, maybe a little too much if it is her desire to have all women come and partake of the richness of her words. I am not saying that her words are unfounded, but she seems to carry her ancestry around with her, almost like baggage. There is no doubt that what happened to her African ancestors, during the time of slavery, was wrong and there is nothing wrong with stating that this is where she came from, but she refers to it several times, unnecessarily, throughout the book.The other angst i have with this book is Dominique’s continual referral to our ‘patriarchal dominated society’ and how women should break free of this. I agree, we do live in a patriarchal dominated, male dominated, society, which can leave some women feeling second best, and there is nothing wrong with Dominique sharing her passion about this subject, but again she refers to it too much and this could be something that could make some women not want to read this book.She also uses the word ‘posit’ quite a lot. I thought it meant ‘possible, possibility or even possibly’ but it actually means ‘to lay down or assume as a fact or a principle, to postulate’ (Dictionary.com). So, I learnt a new word, nothing wrong with that, but repetitiveness comes across to me as a lack of thought, meaning, we rely on the same word because it feels safe.So that is my negative thoughts first and so, now i can leave you with the positive ones.This is a self help book for women. 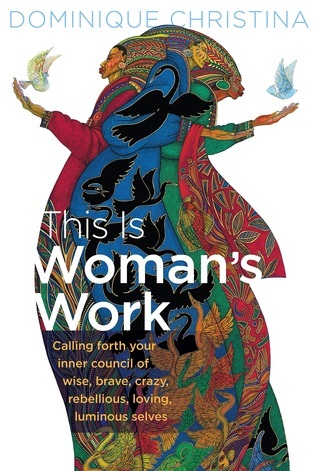 Dominique begins with the question, ‘Why is it important for women to define themselves?’ She then goes on to say that, ‘Each chapter of this book introduces you to an archetype, named and described as I (Dominique) as come to know her.’ Such archetypes as, ‘Ghost Woman ~ She is the waymaker. She knows how not to leave. This is different from not knowing how to leave. The Ghost Woman is an “in spite of” not a “because of”. For all intents and purposes she should be gone…’ Or in fact the ‘Woman with Cool Hands ~ …is the care giver. She is balm and blessing.’Dominique writes beautifully about twenty such archetypes. There were some that would make me think ‘that’s me’ and there were others that make me think, ‘that’s not me’. For all women are not the same and yet we share so much with each other that all women who read this book will find themselves in several archetypes and I think in some ways certain types will be more relevant to us at certain times in our lives.At the beginning of each chapter there is a poem, she has written for each woman and at the end she lists the Attributes of each woman. For the Woman with Cool Hands these are; ‘Selfless, Attentive, Generous, Healer, Altruistic, May struggle with self-care’ because they give all to others and nothing to themselves. Then, Dominique give some writing exercises for us to consider and to help us find our true self, letting go of the ideology put on us by others and society. Then she gives Examples of This (the) Archetype, in this case she give Mother Theresa and the late Princess Diana.If you enjoy the style of book that allows you look within yourself, then you will enjoy this one too. I enjoyed this book. Some of the exercises were easy, some were hard, some were painful. I want to buy myself a copy so that I can work through them again. Started reading this in Macau and finished the next Wednesday. Very empowering book and very good discussion on the types of woman present around and within us. I saw a lot of my auntie in this, but not my mom and not my sister. I saw myself in the shapeshifting woman, because I act/perform a lot in front of other people. Also I like her view on the Beggar and Obedient Woman. She doesn't condemn them, but instead try to understand where they're coming from. Which I appreciate. 胡美麗 doesn't do that, instead just demand them to stand up for themselves and fight for their rights. Sometimes it doesn't work that way. I think I will try some of her writing exercises. Awesome, awesome, awesome! The best book on archetypes I've ever read. Christina's prose and poetry is luminous. There are so many insights, but I'll pick one: In the Third Eye Woman: "The Third Eye Woman is in the universe. And that universe is her body and all of its facets. Further still, her existence is one that is deeply aware that the universe -- the great big, everything, everywhere universe -- is interested in her. Is moving with her. Is grounding her. Is all of her." I won this book in a Goodreads giveaway. I think this book was just more than I was ready for. There were parts that resonated with me, but others that didn't at all. I don't think it had anything to do with the writing though. It was me. I would recommend this book to women who already have a goodunderstanding of who they are, and are experienced in practicing mindfulness. Dominique Christina - is an award-winning poet, author, educator, and activist. She holds five national poetry slam titles in four years, including the 2014 & 2012 Women of the World Slam Champion and 2011 National Poetry Slam Champion. Her work is greatly influenced by her family's legacy in the Civil Rights Movement and by the idea that worlds make worlds. Her poetry collections: The Bones, The Breaking, The Balm: A Colored Girl's Hymnal, published by Penmanship Books, and They Are All Me, published by Swimming With Elephants Publishing are available now. Her third book, This Is Woman's Work, is set for publication by Sounds True Publishing in October 2015.